Ben and I have been members of the Prospect Park Track Club for almost three weeks now and we’re having fun with them. The very first event that we did with PPTC was the Holiday Party at a bar last week. It was an Ugly Sweater Party with a White Elephant Gift Exchange. We didn’t have any ugly Christmas sweaters, but we did have matching Holiday Run tech shirts from a recent race that we had completed. We figured that showing up as a couple with a co-dependency problem was an excellent way of introducing ourselves. The White Elephant Gift Exchange was amusing to watch and participate. We were asked to wrap a running-related item that was worth about $20. Naturally I brought a Simple Hydration bottle and I stuffed it with a couple Huma gels. The procedure of the exchange was that a name gets pulled, the person could either pick a wrapped present or steal from someone who already unwrapped a gift, then either a new name gets pulled or if the person got their gift stolen, they either picked a new wrapped gift or they get a chance to steal a gift themselves. A gift could only get stolen three times (otherwise the game would never end). The best and funniest moments of the White Elephant Gift Exchange was when someone stole. The popular gifts of the night were the foot massage ball, a PPTC backpack, YakTrax, and the book Two Hours by Ed Cesar. I, myself stole the YakTrax and the book and then got those things stolen (by the same person!!!). I ended up with a beanie that has an LED headlight integrated into it. Then following the theme, Ben stole the hat from me (he would say borrow) to wear at the PPTC Holiday Run last night. Last night was the PPTC’s annual Holiday Run to Dyker Heights to see their famous Christmas Lights. Dyker Heights is a fairly well-to-do residential neighborhood in deep southern Brooklyn. 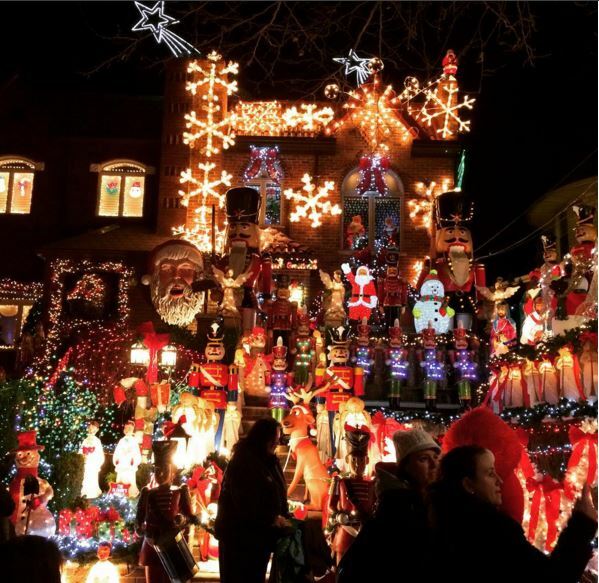 It’s pretty quiet, except for once a year during Christmas time when the row houses bust out their twinkling Christmas lights and inflatable snowmen. Many of the houses have simpler decorations, but other houses go out all out. One house actually had a DJ spinning tunes. Another house was very enterprising and set up a little stand that sold hot chocolate, coffee, and cider donuts. I got a little lost on the way to the meeting spot because I missed the street where I needed to turn and ran a few extra blocks south. The mistake was quickly rectified and I met up with Ben’s group. We hung around until more people arrived and then we walked around the various streets to look at the Christmas lights. Some of the houses are quite impressive. After an hour, the cold was too much and we all headed off to a bar to eat and drink. This running group is much larger and more organized than our old group. The social events have been fun and we already know that we like their races. As we rode in the long subway ride home, we both agreed that joining PPTC was a great idea. Everybody’s been really nice and friendly. This all sounds amazing! I love the holidays and I’m all about holiday-themed runs. This is such a cool idea! 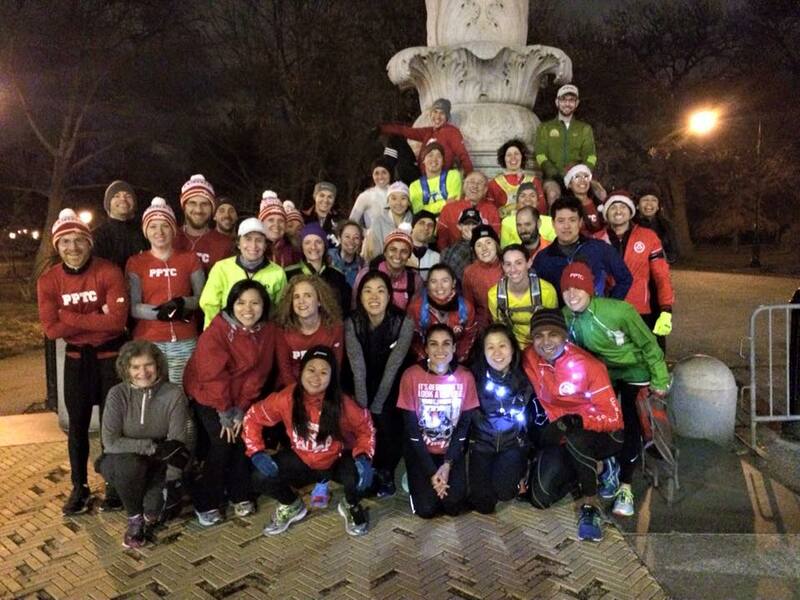 PPTC does other social runs (like the Donut Run) that I’m looking forward to in the future.